SnoreMD is a snoring mouthpiece which works by gently holding the jaw forward to improve airflow during sleep by using precise adjustment. The mouthpiece is first molded to your teeth during the boil and bite fitting process. Once fit, it can be adjusted incrementally to your desired setting. The setting adjusts how far forward the lower jaws sits. 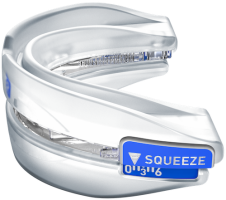 This enables creating an open airway while sleeping, which helps to reduce or eliminate snoring. During sleep, tissues in the throat relax. This can restrict breathing and create an irritating snoring sounds. Does SnoreMD work for sleep apnea? No, SnoreMD is not for the treatment of sleep apnea. Any patient who believes they may have sleep apnea should consult their health care professional. What are the contraindications for SnoreMD? What warnings are there about SnoreMD? Users should consider his or her medical history, including history of asthma, breathing, respiratory disorder, or other relevant health problems, and consult the appropriate healthcare provider before using the device. Who is SnoreMD designed for? SnoreMD is intended for the use on adult patients 18 years of age or older as an aid for the reduction of snoring. Does SnoreMD contain latex or BPA? Unknown. SnoreMD does not mention what their product is made of. Is SnoreMD cleared by the FDA? Unclear, inside the SnoreMD instruction booklet, it says: "SnoreMD is FDA Classified: OTC Part No. MD002" but this doesn't mean that the FDA has cleared SnoreMD for snoring. How long will SnoreMD last? The device should last 9 months of repeat usage. Are there different versions or sizes of SnoreMD? No, SnoreMD only comes in one size. How does SnoreMD compare to other mouthpieces? When reviewing, SnoreMD is similar to SnoreRx. What are the usage instructions for SnoreMD? Brush your teeth and remove partial dentures before using SnoreMD. Your SnoreMD has been custom-fitted to your mouth and should not be used by anyone else. SnoreMD works best if you sleep on your side or stomach. Specially designed pillows and “leg pillows” are available to help you stay on your side during sleep. Some people may experience excessive salivation, dry mouth and tenderness of the jaw, teeth and gums during initial use of SnoreMD. If you wake up in the middle of the night and are bothered by your SnoreMD, just take it out and go back to sleep. Each night, you should be able to sleep longer with your SnoreMD. In just a few nights, you should be sleeping with reduced snoring through the entire night. Ensure SnoreMD is set on the factory setting of 3 mm. Bring a mug of water to a full boil. Submerge SnoreMD into the boiled water for precisely 90 seconds. Remove the device using a spatula or tongs. Quickly dip SnoreMD into a cup of tap water for 2-3 seconds to remove any hot water. Bite down firmly into the device for 30 seconds. Remove SnoreMD from your mouth and place it in bowl of tap water for 60 seconds to set the impression. SnoreMD should display prominent teeth marks after the custom fitting procedure. If this does not occur, repeat steps 1-6. Hold SnoreMD in the “C” position in your left hand. Simultaneously squeeze in both sides of the upper jaw piece with your right thumb and forefinger. If required, use your left fingers as shown to assist movement. To advance the lower jaw piece forward, slide the upper tray in the 1 to 6 direction. To reposition the lower jaw piece backwards, “rock” the upper tray from side to side in the 6 to 1 direciton. Gradually adjust SnoreMD in 1mm increments every night until improvement is noticed. Make sure both sides of the device are adjusted to the same setting at all times. What shipping options and methods does SnoreMD offer? What payment methods does SnoreMD accept? What's the warranty and return policy for SnoreMD? Unknown. SnoreMD does not mention this. No, SnoreMD is not accredited by the BBB (Better Business Bureau). Note: SnoreMD appears to be the same company and mouthpiece as "Silent Sleep". How do you clean and care for SnoreMD? Store SnoreMD in its case in a cool, dry place. SnoreMD should be stored at temperatures between 40 degrees and 90 degrees Farenheit. Periodically clean SnoreMD with a toothbrush and toothpaste. An ultrasonic cleaner is best. Do not use harsh chemicals or household cleaning products like bleach or ammonia. SnoreMD uses a combination of boil and bite fitting and incremental adjustment. This make it easier to get the most effective fit. The mouthpiece is very similar to SnoreRx although it is not FDA cleared and should be thought of as a knock-off. Despite SnoreMD costing less than SnoreRx and being quite similar, we recommend SnoreRx because it's FDA cleared and the business has been around longer.